I'm surprised no one has commented on this yet, because it's a great little tool. It's easy to expand some of the items in the Target-column, e.g. "Person" -> "Party member", "Family", "Enemy", "Last person seen". Totally as a side-issue to this wonderful (as usual) post, but I was wondering what you thought about the use of the term quest. I wrote a post a while back about what I saw was the de-valuation of the word. It used to mean an awe-inspiring search and/or struggle of world-shaking import, and now it means one of several tasks one might elect to undertake in the course of one's career. @Jensan: Thanks. I think I know how to make it more useful, see below. @amp108: Hey thanks, I love that kind of question. First, Ivan used sidequest, so using "quest" was my bad. I was doing it mostly for aesthetics so it would match my previous "Traps!" chart. You're right, I think the word is backported from video games. Actually, the diminishing of what the word means doesn't bother me as much as the connotation that this is something players should or will do. In my games there would probably never be something like the fellowship of the ring unless the players decided to do it (and it came out of a string of random events in the first place). I think the more acceptable term for roleplayers might be "Adventure Hooks", well, sort of, those are also teases and mysterious goings on an such. Maybe the best way to describe these would be NPC requests. And you gave me an idea of how we could make the chart more useful. If they are requests from the local wizard or guild, what will players get out of it, why would they even want to get involved? Hmm, actually it might come up in play *most* when player want something from npcs who then say "sure . . . if you do this other thing for me." Well, anyway, it could be useful in case a DM wants to see if there are any interesting goings on about town. These could also be a subtable that feeds into a rumor table for a city or a region: "Word has it that the Baron is interested in information about . . ."
And to make that work we could add a rewards column: "and he's offering . . ." I think a complication column might be interesting too. I'll try and make another post soon where I show you another draft. Thanks again. Cool, I was thinking "request" I like how it incorporates the original word but emphasizes the optional nature of them. But now I'm wonder what an adventure hook is. Are they just these tasks? Can they be other things to? Are all rumors adventure hooks? 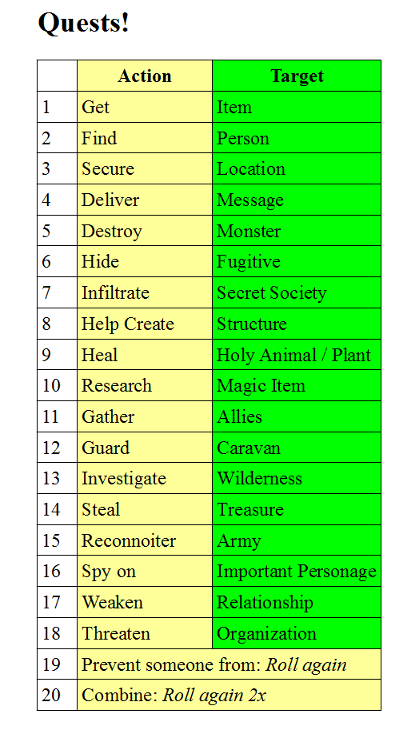 Are adventure hooks different enough to warrant their own chart? How about a "multiphase chart" for when the different columns are independent?